Although targeting many of the unintended consequences caused to American expatriates by President Trump’s tax reform legislation introduced in December, known as the Tax Cuts & Jobs Act, the fixes Yue says are soon to be proposed are not included as part of “Tax Reform 2.0,” according to Yue. Tax Reform 2.0 was formally unveiled on Sept. 10 by House Ways and Means Committee chairman Kevin Brady, R-Texas, to make permanent certain individual tax cuts, small-business income deductions, and other features of last December’s bill, which had been set to expire after 2025. “The reason it is not going to be part of [Tax Reform 2.0 is because] we got left out,” Yue, who is based in Oregon but who is frequently to be found lobbying Congressional leaders in Washington, D.C. on behalf of expatriate Americans, told those attending last week’s London session. 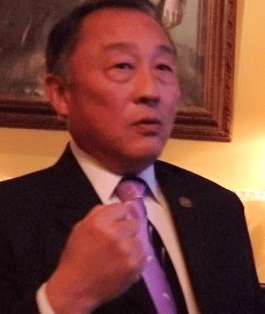 Yue said he was nevertheless optimistic about the chances of passage of the as-yet-un-named legislation, expected to be introduced by Rep. George Holding of North Carolina, citing a growing awareness among key Washington lawmakers of the issues overseas Americans, and their companies, are facing. Yue’s London appearance took place at a private members’ club in London’s Mayfair district, and was free of charge and open to the public. He was joined by David Treitel, managing director of London-based American Tax Returns Ltd (pictured above, to the right of Yue); Andrew Grossman, a retired American foreign services officer now living in London; and John Richardson, a Toronto-based tax lawyer with dual Canadian and American citizenship, who specializes in U.S. expat issues. Yue began his tour in May in Hong Kong, before making a number of appearances in Toronto last month, one of which was filmed and posted on YouTube. A video version of Tuesday’s event is also due to be posted online in due course, the event’s organizers said. Yue was accompanied in his appearance in Paris Last Friday morning, at the American Chamber of Commerce Paris’s rue de Miromesnil office, by Richardson as well as Democrats Abroad France chairman Joseph Smallhoover. According to Yue, Holding’s bill aims to give expatriate Americans the option of replacing the U.S.’s current citizenship-based tax (CBT) regime, as it applies to them, with a “territorial taxation for individuals” (TTFI) regime. Those who would prefer to continue to be taxed under the existing CBT regime could, under this legislation, be allowed to do so. The territorial approach is seen by Yue as being an easier sell to Congress at the moment than certain other options for replacing CBT that have been proposed, because Territorial Taxation for Corporations was a key element of Trump’s recent tax reform legislation. Although popular with Congress for providing a mechanism for forcing giant, multi-national companies like Apple and Google to repatriate earnings they’d been holding offshore for tax reasons, TTFC has hit American expatriates (and “Homelanders”) who have stakes in small overseas businesses with an unavoidable, retroactive and significant tax charge that many say will financially ruin them, if they are forced to pay up. The original deadline to begin to comply with this tax has past, but those affected by it have been granted an extension. Proponents of the TTFI concept argue that it corrects this and other problems in the Trump legislation that emerged only after it was signed into just law three days before Christmas, and which some say were the result of the speed at which it was drawn up and passed by both houses of Congress, in an apparent effort to ensure that it could take effect on the first of January, 2018. Many observers are skeptical that Holding’s bill stands much chance of passage, given the lack of interest most members of Congress have for the problems faced by American expats, but Yue remains optimistic. He thinks that with a bi-partisan lobbying effort, U.S. lawmakers could be persuaded to appreciate the business case for ending what he says is a current “40% premium” that American companies are having to pay to hire Americans to work overseas, simply “because [of the need to compensate them] for the double taxation and [such other issues as] the difficulties involved in getting bank accounts, and so on,” due to the current CBT tax regime, Yue said. A Republican sponsor for a companion bill in the Senate has been lined up, according to Yue, who didn’t say who it was. A search is understood to be under way to find Democratic Congressmen who will promote the Holding legislation, or at least vote in favour of it, which could, Yue and other proponents of the bill say, help to make it a campaign issue in the coming 2018 midterm elections, set for Nov. 8. Although America’s expatriates have historically voted in small numbers, their estimated total number, 9 million, is larger than the populations of all but 11 U.S. states. “This is not a Republican issue, not a Democrats issue, not independent issue,” Yue told his audience. Grossman – whom Richardson said had particular insight with respect to the relationship between tax and nationality – said that for him the “astonishing thing” about the tax issues surrounding Americans who live outside of the U.S. was the fact that “millions” didn’t know they were American until discovering it, typically “when [they’re] told by their banks that they’re closing their accounts” because of the fact of their American citizenship. “And then last year, [Supreme Court] Justice [Ruth Bader] Ginsburg invented a new nationality law, by saying that it’s unconstitutional to treat non-marital children differently from marital children. “And I can say, from personal experience, that one of my grandsons, who is British, would be an American citizen if he were born after last June, 2017, but he isn’t, because he was born in 2013. Grossman then described how particularly unfairly Americans living outside the U.S. have been treated by the regulations affecting trusts and estates. Richardson called on those in the room, including others working in the legal and tax professions who look after Americans affected by the issues, to get actively involved in bringing about a change in the system, and not, for example, to continue to allow “government officials to negotiate tax treaties in the darkness,” or to merely show their clients how to pay certain taxes rather than “standing up for their clients, and looking for reasons they shouldn’t have to pay [them]”. “One things it seems to me we can do with individual activism is to force the negotiation of these tax treaties out into the open,” he said. Countries like the U.S. and Canada have the right and the obligation, he went on, to interpret their tax treaties with the U.S., starting with “the transition and GILTI taxes, on the basis that they violate the general presumption against double taxation. I recognize that these are hard arguments, but these tax treaties exist for a reason – and the prohibition of double taxation is one of them. 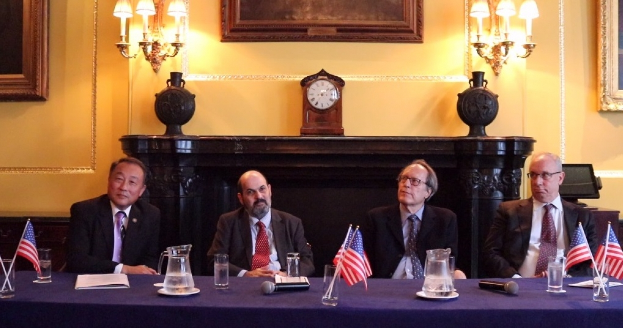 The panel discussion on tax wasn’t without its lighter moments, one of which came when the American Tax Returns Ltd’s Treitel recalled an event from an earlier time, when American citizenship was seen rather differently than, increasingly, it is now. “I’ve often wondered whether that gave Churchill the opportunity to pay tax in the United States,” Treitel said.